Marianne Conti Burt was a painter. Her husband, Craig, was a freelance digital retoucher. Both have degrees from the prestigious School of the Art Institute of Chicago. But when the recession hit in the late 2000s, their careers fell apart. They were forced to downsize their home in Raleigh, N.C., sell many of their possessions and give away their dog. 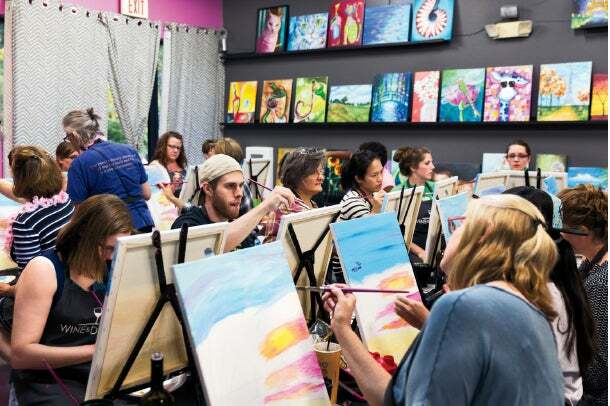 Marianne began looking for jobs on Craigslist and saw a listing for art teachers from a new studio called Wine & Design; it was part of the then-emerging “paint and sip” trend, where friends or coworkers have a few drinks while painting. “I didn’t think this painting-and-drinking thing would take off,” Marianne says, but she and her husband were low on job options. When they were hired, they expected it to be temporary -- but Wine & Design became popular, and the Burts loved the work. In 2011, they signed on as the company’s first franchisees. Today they own two studios (in Cary, N.C., and nearby Apex) that are open every day and employ 12 art teachers. Was switching to teaching difficult? Marianne: It took some time to get used to. At first I did not understand how this concept worked. I’ll never forget the day I looked at someone’s canvas and the lightbulb went off. I thought, They don’t know how to paint. Their success is based on my step-by-step instructions and giving them something they can do. I realized this was kind of golden for us. We were both in our 50s, and I thought, We should do this. Can a customer become a real artist? Craig: This is not an art class, but there are tips and techniques customers pick up through osmosis. It’s really about being social and doing something they’ve never done before. Marianne: There are those people who have never touched a paintbrush before and discover something in themselves they didn’t know was there. That pleasure and experience is so overwhelming that they can’t wait to do it again. Is there a customer stereotype? Marianne: It’s everyone. Saturdays, for example, we’re usually slammed with kids’ birthday parties and bachelorette parties, and that’s just in the studio. We also have classes on wheels; we go to places like wineries, breweries, churches and homes to teach. How do you explain paint-and-sips’ popularity? Marianne: We offer a fairly inexpensive night out. It takes people away from their woes. It’s like a two-hour vacation with a little art therapy thrown in.